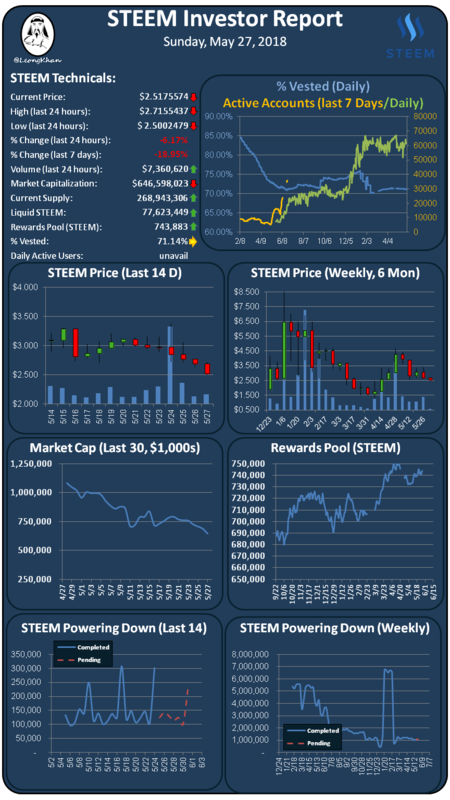 The STEEM price is down 6.17% verse the USD over the past 24 hours on higher volume ($7,360,620) as Bitcoin is down at $7.3k and the broader market is down. STEEM is down verse Bitcoin as Korean trading is down at 19% of the trading volume. New account creation data is not available today. The % vested indicator is flat at 71.14% on steady power downs and low power ups. Daily active account data is not available today. SBD is at $1.75 on Bittrex which is still very elevated over the peg, receive you rewards in 50% SBD and then use the SBDs to buy STEEM on the exchange. SBD conversions are a waste of money again! I'm sure some people will panic over the falling Steem price, but we've seen it far lower than this. I think it's important to remember that there have to be good reasons for the price to go up, such as the coin being genuinely useful. I think Steem has that potential and just needs more people to realise that. Otherwise it's just a bubble.